I’ve been thinking a lot about why. Why, why, why? In primary school, we were taught to ask the five W’s (and the accompanying H) to dissect situations in literature and beyond: “Who? What? Where? When? Why? How?” It trips off the tongue so elegantly that it almost runs together into one word – the all-encompassing “Whowhatwherewhenwhyhow?” The list seemed so comprehensive and complete, as if there were no other questions to ask. Of that list of fundamental questions, the why wandered into the forefront over the past few decades. Modern management theory teaches us to ask why at least five times to get to the root cause of a problem. And much-acclaimed Simon Sinek claims that the soul of an organization is not the how or the what, but instead the why behind its actions (watch his fantastic TED talk here). I love the why. I resonate with the why. I am a big supporter of the why. But there’s a problem with why. Our current usage of why is so broad as to be confusing. “Why?” can be answered on many levels. A legitimate answer to “Why did you spend Saturday with your family?” can be anything from “Because my kids had a soccer game” to “Because I prioritize my family and put them first.” To use the examples above, the why behind root cause analysis and the why that Simon Sinek preaches are actually quite distinct. 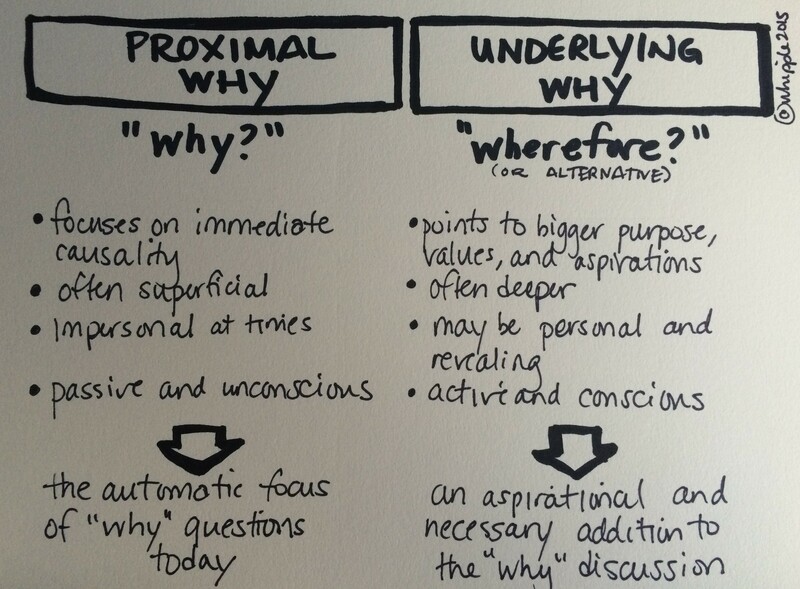 There are (at least) two whys in the world: The first why is the proximal why. It is the immediate impetus for an event or action, and is often more of a superficial answer. The second why is the underlying why. You can think of this as the big why. Instead of lingering on immediate causality, the underlying why invokes our purpose, values, and aspirations. If we keep on asking ourselves the “Whowhatwherewhenwhyhow?” litany, we tend to gravitate towards the proximal why and forego the underlying why. Since the English language currently conflates the two whys, it is hard for us to answer both in a clear and satisfactory way. I propose separating the whys and adopting new taxonomy. Let’s allow the proximal why to keep the word why. It’s common, it’s easy, and it’s established. But let’s introduce a new word for the underlying why. Let’s give it a separate word so it becomes its own distinct and important question. We could call it anything really: “Whereto?” “What to?” “Towards?” “Pineapple upside-down cake?” For simplicity, though, let’s try wherefore. The etymology of wherefore makes it a good fit for the underlying why. It is an archaic form of why also defined to mean “for what” or “for what reason.” Perhaps the most famous use of wherefore is from Juliet’s soliloquy about Romeo in which she asks “Wherefore art thou Romeo?” (i.e., “Why are you Romeo?”) This question invites deep reflection; it is not sufficiently answered by “He is Romeo because that’s what his parents named him” but instead calls forth questions of the meaning of names, the importance of family affiliation, and the function of fate. I invite you to start using “wherefore?” in your everyday life. Reflecting on my own decisions, when I’m able to clearly answer the wherefore, I’ve often been more intentional about my path. When I don’t know the wherefore, I have been hasty, unreflective, or, frankly, just a bit lazy.